Now that the core is flowing, the word “recovery” is on the tip of everyone’s tongue. How was the recovery? Did the recovery improve? Man, the recovery has been great! Low recovery is a bad thing because it means we drilled through a section of rock and didn’t get much in the way of samples. That means we gain less information about that region of the crust. Hard rock drilling (igneous and metamorphic rocks like we’re sampling on this expedition) is notorious for producing low recovery values. The record for hard rock recovery was set right here on Atlantis Bank in 1987, 86%; this gives us very high hopes for this expedition! So far, we’ve had ups and downs; the start was promising with 50-60% but then things fell to 20-30%. 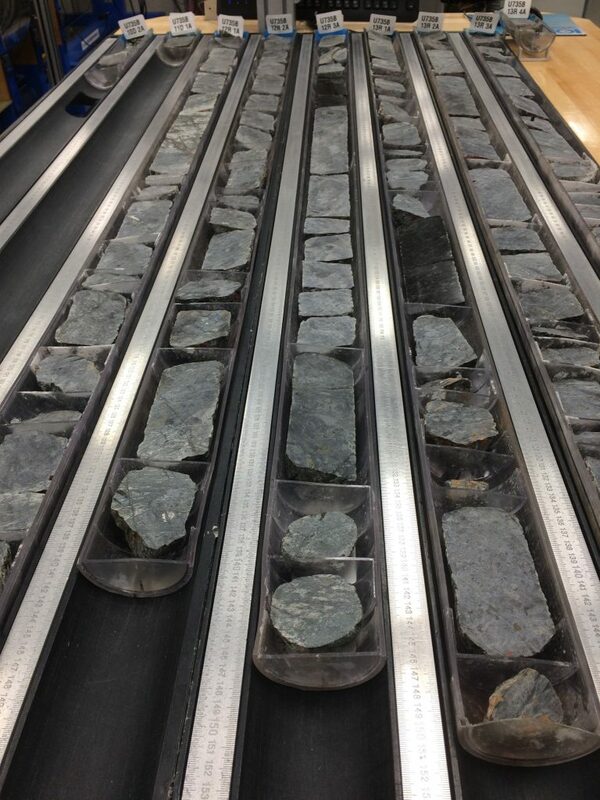 Scientists on the ship think we were drilling through an area where the rock was already fractured. Since then things have improved and we recently even hit over 80% in one core. The hope is we’ll do even better as we get deeper, who knows maybe we’ll even break that 86% record!